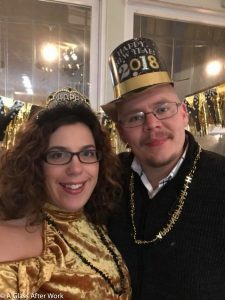 Hubby & me ready to say goodbye to 2017! Happy New Year, wine friends! First, a quick update on Hubby. He had his follow-up PET scan last week, and we received the results this morning. The great news is the scan is better than the one from October. It showed continual improvement and “almost complete normalization.” The unfortunate news is there is still some residual metabolic activity, so the doctor couldn’t use the magic word “remission” yet. As the cancer is a very aggressive lymphoma, the oncologist believes that if it was still living, then the scans would be getting worse, not better. However, he doesn’t want to say Hubby is cured without being positive that this is the case. What this means for Hubby is no additional treatment (YAY!). Instead, he will also do another PET scan in April. Obviously, we both would have preferred to know this was completely behind us. But, things are trending in the right direction. Hubby’s already feeling about 75% normal, so we’ll just keep working on building his strength and getting him healthy. We’re both registered to run the Cherry Blossom 10-Miler at the beginning of April, so by the time he goes for what will hopefully be his final PET scan, Hubby should be in good shape and ready to embrace the magic word that we are so ready to hear. Second…my New Year’s thoughts about the blog. Obviously, I’m out of the habit of blogging. And, I miss it. But, I also know my priorities have changed over the last year, and writing detailed blog posts several times a week is just not going to happen. So, I’m changing my approach and will be embracing an even more diverse online presence. Hopefully, you’ll continue to check here, as I will post in-depth reviews of wine and wine-related things about twice a month. I will post my everyday tasting notes on Vivino (as Alleigh @ A Glass After Work). For those interested in my food and wine lifestyle photos and thoughts, follow me on Instagram (as Alleigh77) and Facebook (as AGlassAfterWork). I’m even hoping to do a bit on Facebook live, so if you’re interested in unboxing videos, be sure to like my page. And, of course, I will continue to participate in live tastings and wine chats on Twitter (as @Alleigh). All in all, 2018 is off to a good start for us. We hope the same is true for you. 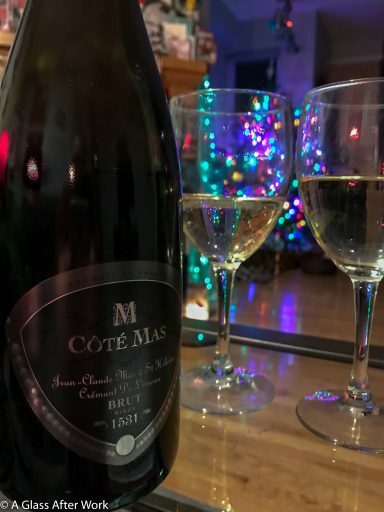 And now we’re off to toast our news with a yummy Côté Mas Crémant de Limoux Brut from Languedoc in southwest France. Cheers! Great news. I’m so glad your husband is doing better! We’ll have to do a wine Tweet chat soon!